The name of Black Isle Studios has returned, but without the people who made any of their games. Planescape: Torment. Icewind Dale. Freaking Fallout. Mention any of these game titles in the company of computer RPG fanatics and they will bow their heads in reverence to Black Isle Studios. In the 90s, the developer was a division of publisher Interplay Entertainment, responsible for cementing the image of what playing a CRPG means to millions of gamers. Several key members of Black Isle left the company in 1998, while others migrated to Obsidian Entertainment. In 2003, Interplay closed Black Isle and laid off all its remaining staff due to financial reasons. 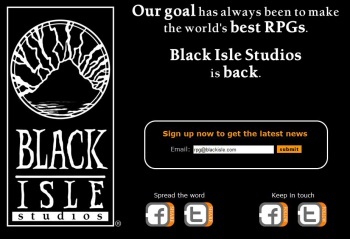 Apparently, that wasn't a permanent decision because today Interplay opened up a new website, Facebook page and Twitter account with the proclamation "Black Isle Studios is back." That statement is preceded by this acknowledgement: "Our goal has always been to make the world's best RPGs." The mission statement listed on the Facebook page goes into way more detail: "Black Isle Studios is a division of Interplay formed to develop and publish high quality, commercially successful computer role-playing games." But the re-opening of a studio with the name Black Isle Studios doesn't really mean anything. The trademark name holds weight among gamers, but as far as anything we can glean from the sources, the staff of Black Isle will not include any original members of the team. With Baldur's Gate: Enhanced Edition coming this fall from a different developer and Interplay recently surviving a long legal battle with Bethesda over the rights to the Fallout MMO, one wonders exactly what this new puppet studio will create. So, you may get your hopes up for "the world's best RPGs" - but I'll be back here playing my old CD-Roms of Baldur's Gate - all six of them!